We are engaged in manufacturing, supplying and exporting a wide range of Skin Blade to our clients at leading prices in the market. Offered products are widely demanded for the purpose of removing unwanted hair from the patient's body. These blades are safe to use and are manufactured using high-grade quality raw material, procured from authentic vendors of the market. We make these products available to the customers at leading prices in the market and in varied specifications, in order to serve our clients in the most effective manner. 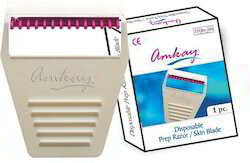 We are a prominent industry engaged in manufacturing, supplying and exporting a qualitative assortment of Disposable Prep Razor. We manufacturer Prep Razor / Skin Blade with platinum edge blade mainly used by hospitals before operation to remove unwanted hairs from the patient. Quality of blade is one of the best available in India. Our Prep Razor body is made for better grip of the user. We manufacture these products using high-grade quality raw material, procured from authentic vendors of the market and make these razors available to the clients at leading prices in the market.